Take charge of yard with Toros PowerPlex 40V Max* T180 Lithium Ion battery and get up to double your run time. The T180 battery has 40-volt max, 5.0 Amp-Hour, and 180 Watt-Hours. It charges in approximately 120 minutes in the quick charger. This battery comes with an USB port, LED flashlight and a folding handle to give you a versatile power and light when needed. The T180 battery is interchangeable with the Toro PowerPlex tools. Take charge of the yard with Toro PowerPlex tools. 40-volt max, 5.0 Amp-Hour, 180 Watt-Hour battery. Charges in approximately 120 minutes in the quick charger. Comes with on-board power meter. LED Flashlight with auto-off<!-- nothing --> after 60 minutes to conserve battery charge. USB charging port for charging small devices and a folding handle for easier carrying. CORE18V produces up to 1,440 Watts of energy, 80% more than previous-generation 6.0Ah batteries. Drilling in concrete with the Bosch GBH18V-26 SDS-plus Bulldog Rotary Hammer, the CORE18V delivered up to 32% more holes than previous-generation 18V 6.0Ah batteries. Carrying more energy density than the previous-generation cells, the 10 next-gen, high-powered cells in this battery are welded and rail-connected for high-current efficiency. The 1.8 lbs. CORE18V features the Bosch-exclusive CoolPack 2.0, which is an advanced configuration that provides up to 35% more cooling effect than predecessor batteries and provides up to 135% more battery life than batteries that don't have CoolPack technology. The optional Bosch BC1880 18V Fast Charger can charge a spent CORE18V to 80% in 41 minutes and to 100% in 55 minutes. CORE18V is the compatible, compact and lightweight high-power 18V Lithium-Ion battery. 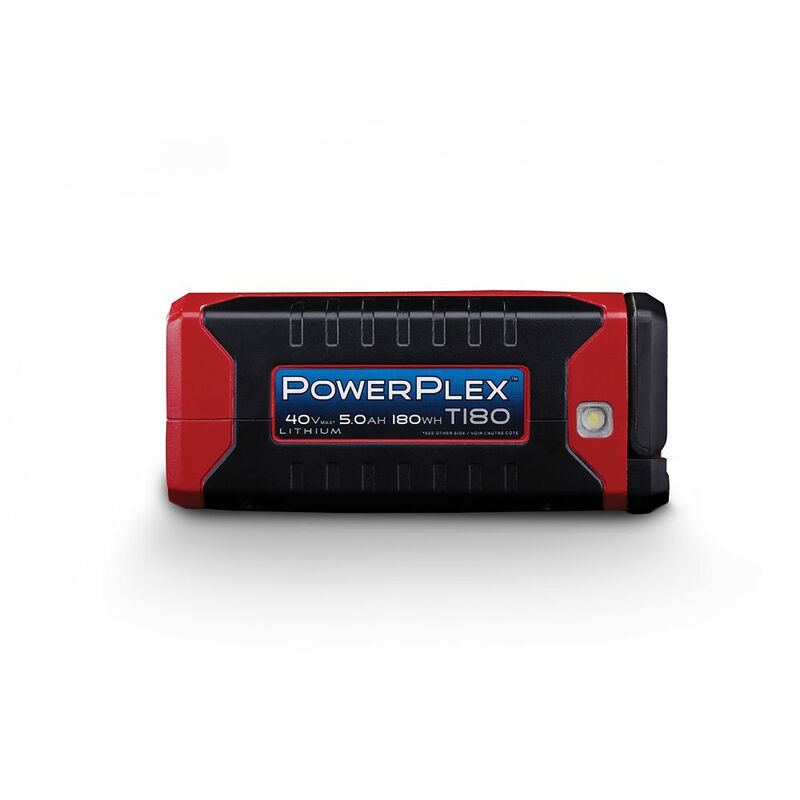 PowerPlex 40V Max T180 Li-Ion Battery Take charge of yard with Toros PowerPlex 40V Max* T180 Lithium Ion battery and get up to double your run time. The T180 battery has 40-volt max, 5.0 Amp-Hour, and 180 Watt-Hours. It charges in approximately 120 minutes in the quick charger. This battery comes with an USB port, LED flashlight and a folding handle to give you a versatile power and light when needed. The T180 battery is interchangeable with the Toro PowerPlex tools. Take charge of the yard with Toro PowerPlex tools.